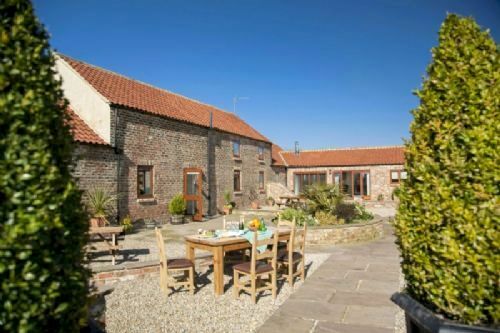 Once is never enough for those who discover the 5-star Thief Hole Cottages in North Yorkshire and guests can’t wait to come back for more. Owners Jessica and Phillip are overflowing with Yorkshire hospitality to make guests feel more like friends, from having the bubbly on ice to hanging balloons for special occasions. They especially go the extra mile for families, providing a helpful baby and child welcome pack, as well as a generous hamper of goodies, and all the baby kit and caboodle that parents really need – high chairs, travel cots, steriliser, monitor, bed guards, potty, crockery etc. Little ones will be just as delighted as the grown-ups with their holiday home from home, either delving into the collection of toys or having fun in the outdoor play area, with a swing and slide set, see-saw and play house. 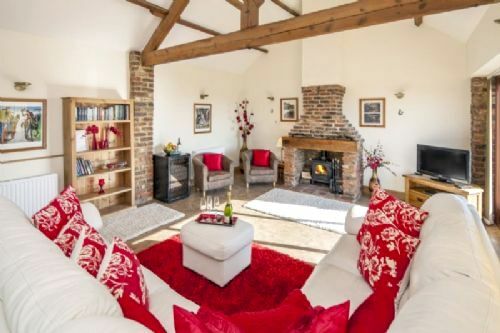 Thief Hole Cottages are a top class conversion of period barns, which have been furnished and finished to boutique hotel standards, some with private hot tubs. 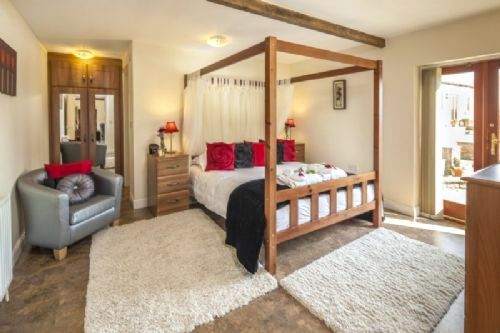 Each one is a masterclass in achieving a stylish balance of period character and contemporary comfort, from beamed ceilings, feature fireplaces, wood burning stoves and four poster beds to big leather sofas, flat screen TV’s, iPod docks, free Wi Fi and gleaming, designer kitchens. The owners also make guests feel special and spoilt with all those boutiquey extras, from Champagne, chocolates and fresh flowers, to fluffy robes and towels, cosy slippers and spa toiletries. For families to spill outside, eat outdoors and enjoy the fab views, the cottages have large gravel and flagstone terraces to the front and rear, with picnic benches, tables, barbecues and, in many cases, hot tubs. 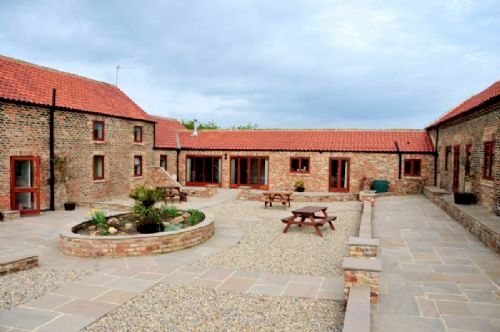 The cottages are also surrounded by fields and there is plenty of grassy space for children to charge around, as well as the toddler friendly play area. Thief Hole Cottages comprises Thief Hole Barn (8+1), Swift Nick Cottage (4+2), Fawkes Cottage (2+2) and Turpin Cottage (2+1). 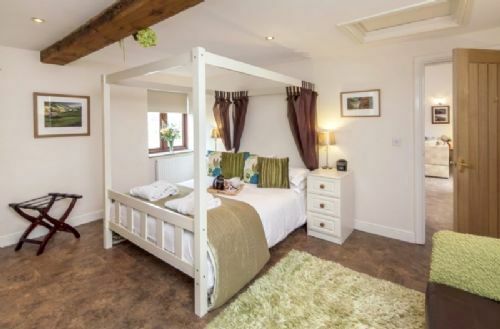 Six travel cots are available for babies and all the cottages have space for at least one cot in their bedrooms. 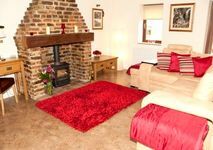 The cottages can be booked exclusively for family get-togethers and celebrations of up to 16 adults, plus children and babies. 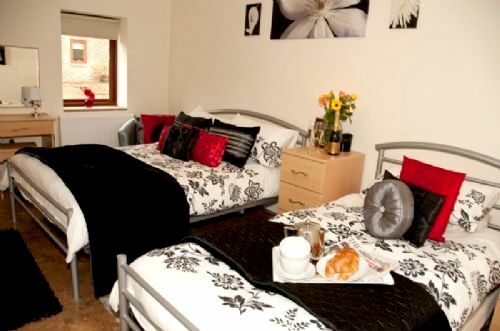 Fawkes Cottage (with hot tub) sleeps 2 + 2 children and a baby in a cot. 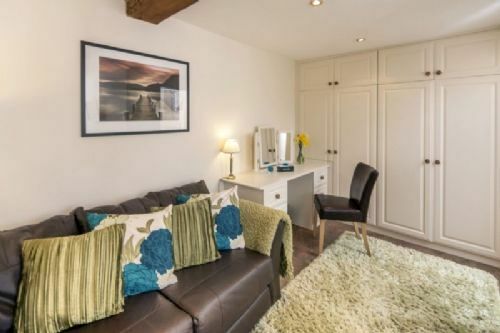 It is a cosy, yet roomy ground floor cottage, which makes things a little easier with a pram or pushchair. The beamed living, dining and kitchen area is open plan, with French doors opening to the outside terrace, overlooking the fields beyond. 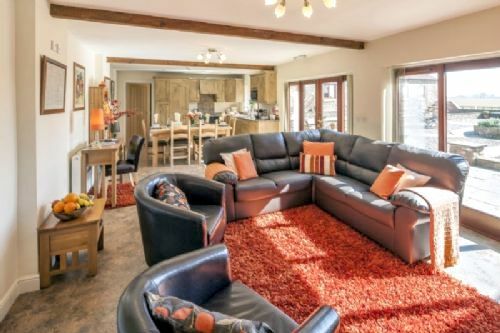 Families have a big, L-shaped leather sofa to cosy up in front of the wood burner and watch one of the DVD’s provided or just scroll through the Freeview and Sky Channels on the flatscreen TV. Parents can chill out to CD’s or some tunes through an iPod dock while little ones play with the toys on the deep-pile rugs. A modern take on a farmhouse kitchen features a central wood dining table, solid wood units and all the latest appliances, including eye-level oven and microwave, fridge-freezer, electric hob, Nespresso, dishwasher and washer/dryer. 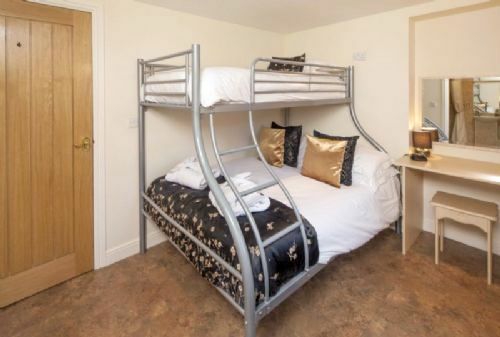 The master bedroom has a king size four poster bed, TV, DVD player, sofa bed and an ensuite with a bath and overhead shower. Outisde is a private terrace with BBQ and hot tub. 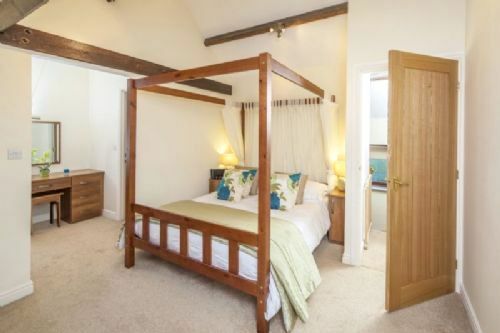 with a four poster king size bed. A good pub is a short walk away and there is a bus stop which can take you into the village a short stroll away. 6 Cots (travel), baby bath, baby bouncer, baby monitor, steriliser, potty, stairgates, bed guards, plastic crockery, plastic cutlery and sippy cups. Pre arrival shopping and catering service can be provided by prior arrangement. Buckets and spades, swings, paddling pool, play house, and slide. BBQ are and lots of green space to run around. Romanby golf course is under an hour drive. There is a log burner in the lounge.